Appearance: Brick red with medium thick, evenly spaced legs. Nose: Black currant, old book, grape juice. Palate: Medium bodied and chewy. Wild blackberries, old oak, white pepper. Finish: Very soft. A subtle tang and tannic bite. Parting words: Although what’s now Eastern Turkey was probably the birthplace of wine (according to archaeology and even the book of Genesis), Turkey’s first commercial vineyard was founded in 1925 at the behest of president Ataturk. There are still a number of state-run vineyards and Turkey is one of the world’s largest producers of grapes but little of that output makes it to the U.S.
Kavalidere’s Öküzgözü of Elazig is one of the few labels that makes it to this side of the pond. When I first opened this bottle it was vile. Moldy cardboard nose and thin. I thought it may have been tainted but I’m always reluctant to take bottles that I bought on sale back to the store. After being open for an hour, it seemed to improve slightly, so I just capped it and waited until the last day. It is dowright drinkable now, but still with a slightly musty aroma. It does fine as a dryish weeknight table wine, but I wouldn’t pay over $11 for it. Of course vintages vary, as always. Kavalidere 2010 Öküzgözü d’Elazig is mildly recommended. 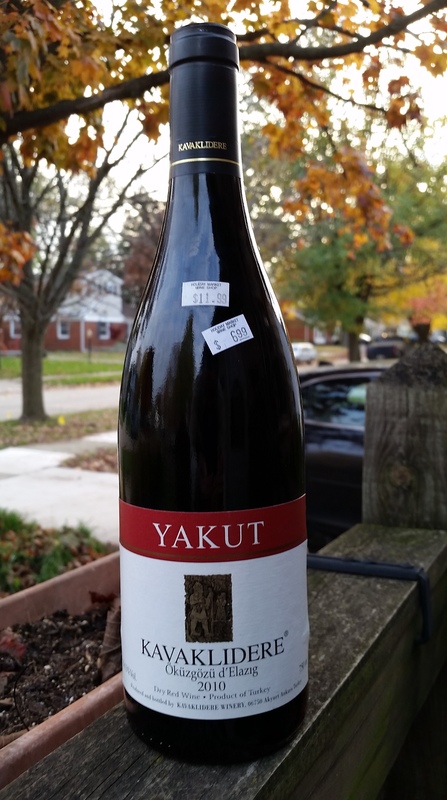 This wine is very common in Turkey but not necessarily one of the best. I would recommend Sarafin, Turasan, Kavaklidere Pendore among the mass productions; and Chateau Kalpak, Chateau Nuzun, Selendi and Chamlija brands among the boutique producers. Thanks for the recommendations! I will look for those.